Los Angeles (AFP) - Former world champion Liam Smith of England and unbeaten top-ranked contender Rafael Mensah of Ghana each attempt to dethrone undefeated world boxing champions in a Saturday card at Las Vegas. Smith, 26-1-1 with 14 knockouts, fights outside Europe for only the second time in his Vegas debut when he faces Jaime Munguia, 29-0 with 25 knockouts, for the 21-year-old Mexican's World Boxing Organization junior middleweight title. "To go to Vegas and fight for a world title is every fighter's dream," Smith said. "But it's only an extra incentive to my main motivation â- getting that WBO world junior middleweight title back around my waist." Six days before his 30th birthday, the Liverpool native will try and recapture the WBO crown he took from John Thompson with a seventh-round stoppage at Manchester in 2015. Smith defended the title twice before surrendering it to Saul "Canelo" Alvarez in a knockout loss in Texas in 2016. He's won three fights since and after pulling out of a May fight with Sadam Ali due to illness finds himself with another chance at the crown. "Munguia is obviously a dangerous puncher and I'll have to be wary of him early on, but he has never fought someone as good as me and a fully-fledged 154-pound fighter," Smith said. "I can't afford to look an inch past Munguia though. He's world champion for a reason. With such a high knockout percentage I'm going to have to be my best ever. Unfortunately for Munguia, that's what I'll be." Munguia stepped in for Smith in May and stopped Ali with a left hook in the fourth round for the title. He defends it for the first time in only his second Vegas bout. "I feel very motivated now that I'm a world champion," Munguia said. "Everyone is going to talk about to me after this fight. This will open up more opportunities and people will mention my name with the likes of Canelo Alvarez and Gennady Golovkin." But the champion understands his British rival has a wealth of experience to draw upon. 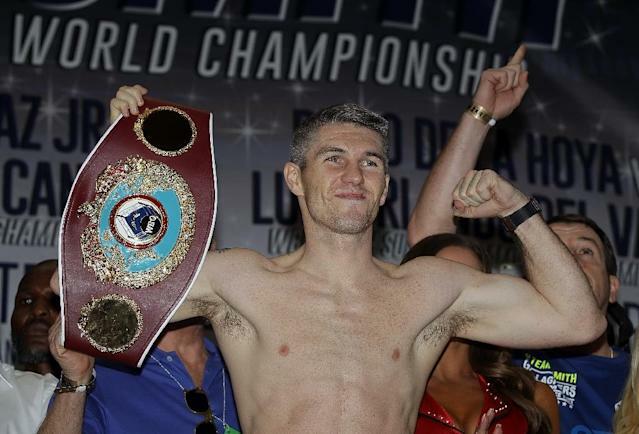 "The only advantage that Liam Smith has is that he's fought in big events before. But I have many fights under my belt. I have a lot of experience. I had over 100 fights as an amateur," Munguia said. The co-feature sends Mensah, 31-0 with 23 knockouts, against World Boxing Association super featherweight champion Alberto Machado, 19-0 with 16 knockouts. "I will defend my title with blood and honor," Machado said. "I'm preparing more than ever to walk away with my hand raised in my first defense." Machado, a 27-year-old Puerto Rican southpaw, took the 130-pound division crown from Panama's Jezreel Corrales by eighth-round knockout last October. Mensah, 27, fights outside his homeland for the first time in his first world title attempt since the southpaw turned professional in 2010. American Gervonta Davis, 20-0 with 19 knockouts, owns the WBA super champion title in the division.